Marko Pogacnik, Slovenian artist, healer, prolific author and recently appointed UNESCO Artist for Peace is beginning a world workshop tour of Geoparks. Marko will be visiting the Burren in May of this year to lead a workshop in working with the new multidimensionality of the land through special landscapes. The workshop will involve exercises from his Gaia Touch series. 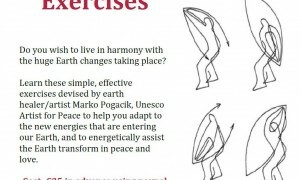 In advance of Marko’s visit Jackie Queally of earthwise will be offering workshops in Ennis and Galway to introduce people to his exercises and concepts.